A few years ago, when Meg Whitman began expanding eBay internationally, many questioned her strategy. In fact, more than a few thought eBay was a uniquely American concept—that it worked only in an optimistic culture and that people really had to trust each other. Whitman was convinced otherwise, saying “the urge to trade is human nature.” Today Germany is the best eBay franchise worldwide with per capita annual trading volume the highest in the world—more than $100 for every German man, woman, and child. Today, China burns coal for most of its power needs and imports 40% of its crude. However, under a memorandum of understanding just signed with Iran, China will secure oil and natural gas valued at tens-of-billions of dollars. The deal sees China’s Sinopec Group developing Iran’s Yadavaran oil field in exchange for agreeing to buy 10 million tons of Iranian liquefied natural gas annually for 25 years. Japan signed a $3 billion deal that gave Tokyo the right to develop Iran’s massive Azadegan oil field in exchange for oil. Japanese officials said they had little choice in doing the exchange given their country’s heavy reliance on energy imports. Call-in commercials can be terrific. . . If you have a relationship with a local radio station and you can get them to allow you to “call your commercial in” and have an ad lib discussion with the personality/disk jockey, you can get great results. Announcer: Well, it’s time to talk to old Joe at the Bargain Barn and find out what kinda do-dad or whirly-gig he has come up with as the value of the day. What have you got this time? I hope it’s not another square wheeled bicycle. Old Joe: No, that was a one of a kind. Seriously, today we have a fruit dryer that you can use to dry all kinds of fruits. Announcer: What if I don’t know any wet fruits. Old Joe: This allows you to slice and dry peaches, pears, and apples so you can save them as long as you want. Just think how good they’ll taste in your lunch box...and it’s good for the kids to snack on. Announcer: How big is it? Old Joe: I’d say it’s about four feet high...etc. Ad Lib Fact Sheet. . . If your station has live personalities, try to talk the station into letting you give the announcers fact sheets so they can ad lib your commercial in conversation manner. This makes the commercial sound like a personal endorsement, and every commercial will be different. Try to get the announcer to drop by your place of business. If you run a restaurant, insist they come by and have lunch or dinner. If you have a video store, give them a free pass so they can review videos as part of your commercial. Once I worked at a station where every commercial was live and 95% were fact sheet spots. Most of the time we were told to “kid around” with the sponsor a little bit, such as: Those chili dogs are so sloppy you have to eat them in the bath tub, but are they good! Or, I can’t figure out what that laundry does with the buttons on my shirt...they always keep one as a souvenir...but that Ethel and Bob at Cleanway Cleaners are such nice folks, and the prices are so low, I don’t care what they do with my buttons. For the past few years I have been privileged to write and voice-in commercials for a major drug store chain. Before I wrote a word of copy, I went to a couple of locations and talked with customers and employees to get a handle on the typical customers and how they viewed the store. We learned that price was not the motivation that brought people to the store. We found that among the primary concerns were a no-hassle refund policy, short check-out lines, and selection. I was allowed to create “heart sell” commercials, which talked about the company’s roots as a corner drug store that opened the same year Judy Garland first sang “Somewhere Over The Rainbow” and Ty Cobb said farewell to baseball. The advertising was geared to distance the chain, in the mind of the customer, from the mass merchandisers. We even said, “We were nearly caught up in the mass merchandising syndrome, like the others, but we have vowed to get back to the basics”...etc. To that end about one third of the radio advertising was geared to the company’s own employees! This campaign paid excellent dividends in long term business increases and improved perception by the public and the chains own employees. Give A Gift To A Friend Or Associate. If you know someone who might benefit from this newsletter, feel free to forward it to them! (See the "box" at the end of the newsletter for the forwarding service. Continental Trade Exchange (Milwaukee, WI) Holiday Expo will be held Saturday, November 6 at the Milwaukee County Sports Complex, 6000 W. Ryan Road, from 10:30 a.m. to 5 p.m. For more information call (262) 780-3640. American Commerce Exchange (ACX) will hold their Annual Trade Fair on Sunday, November 7 at the Glendale Community Center, from 10 a.m. to 4 p.m. For more information call (323) 259-2340. Continental Trade Exchange (Modesto, CA) Holiday Expo will be held Sunday, November 7 at the Modesto Centre Plaza, 1000 L Street, from 10 a.m. to 3 p.m. For more information call (209) 543-9229. Continental Trade Exchange (Columbus, OH) Holiday Expo is scheduled for Tuesday, November 16 at The Hoop, 4185 E. 5th Avenue, from 2 p.m. to 8 p.m. For more information call (740) 201-0201. Continental Trade Exchange (Pleasanton, CA) Holiday Expo will take place Saturday, November 20 at the Crown Plaza Suites Hotel, 11950 Dublin Canyon Rd., from 10 a.m. to 3 p.m. For more information call (925) 516-5600. The Barter Company’s Annual Trade Show will be held on Saturday, December 4 at the Cobb Galleria in Atlanta from 12 noon to 5 p.m.. Over 36,000 sq. feet will be dedicated to the trade show. For more information call (770) 591-4343. Continental Trade Exchange (Santa Rosa, CA) Holiday Expo will take place Sunday, December 5 at Santa Rosa Veterans’ Memorial Building, 1351 Maple Avenue, from 11 a.m. to 4 p.m. For more information call (707) 585-7722. The world’s largest alternative currency is frequent-flier miles. Over 10 trillion are now in existence, valued at 2-cents each, for a $200 billion private currency. It’s a currency used in various ways by many different companies and industries. Noteworthy is the fact that major corporations routinely pay cash to acquire this alternative currency because of its perceived (greater) value in the marketplace. The most recent example of such a purchase was American Express fronting $500 million to financially strapped Delta Airlines, to purchase SkyMiles points. American Express will use the miles as incentive give-aways for their customers. Macy also reported that TeleTrade saw a 194% increase in activity on eValue.net—TeleTrade’s site for independent trade exchanges—on a total volume of $31,257,736 for the first three-quarters of 2004. For more information go to: www.eValues.net. Look who’s making a comeback... Over the past decade, membership in the Direct Selling Association has jumped 89%, to 227 companies hawking everything from tools and golf clubs to legal services and utilities. U.S. direct sales reached $30 billion last year, close to 1% of all U.S. sales. ARTrade (www.artrade.ca) based in Hamilton, Ontario, has been busy promoting its high quality art to the barter industry. 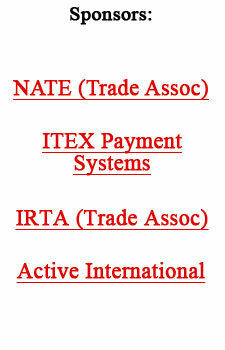 Brian Owen, president of ARTrade, attended the annual conventions this past September of both NATE and IRTA. His latest move is to form a strategic alliance with Bentley Commerce promoting their art reproductions on Bentley’s hospitality exchange (www.hospitalityexchange.vbarter.com) which has some 200 resorts, hotels, motels, and B&B’s as members. • With stock prices sagging many online investors are making fewer trades, while others have stopped trading altogether. Just 5.9% of U.S. households will trade online this year, according to Forrester Research, down from 7.2% in 2000. To boost trades discount brokers are busy bartering with their clients, providing various incentives including golf and ski promotions to win back or retain their business. • The Internet’s “big three” (eBay, Google, Yahoo) are showing surprising earnings and it now is obvious that not only has the Internet changed everyone’s lives, but it has finally arrived as a profit engine. And the potential is dramatic, given that internet advertising still accounts for roughly $5 billion of the $500 billion world-wide advertising market.